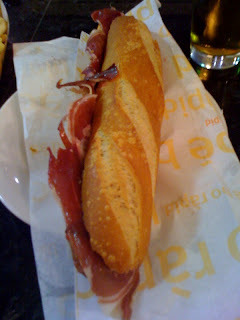 As far as sandwiches go, the Spanish believe that less is more. Most of the bocadillos we came across were simply meat and bread. Some had a thin layer of tomato spread across the bread in the same fashion you would spread butter and some had a light drizzle of olive oil. They are all about their meat, and pork dominates. You see legs of Jamon Iberico hanging everywhere. It felt like the Spanish treat the sandwich as more of a snack than a meal, and that could be a big reason for the less is more mentality, but it could also be a product of the fact the European portion sizes are smaller. So the so-called world's best sandwich was a bit of a disappointment, but it could have been for a number of reasons (unreasonably high expectations, cultural differences, etc.). I personally didn't even think that it was the best sandwich that Café Vienna had to offer. Their beer, however, was probably the most refreshing beer I've ever had. It is a good sandwich, and a great snack, but not the world's greatest in my opinion. In terms of the more or less argument, I think it’s a matter of personal taste. To me, it’s all about the meat. If the meat isn't quality, and there isn't a generous portion of it, then it’s just another sandwich. It doesn't matter what else is on there. I can appreciate unique and tasty ingredients, but to me it’s like putting really nice accessories on an average car. Occasionally a sandwich comes along that's an exception to this rule, but some of the best sandwiches I've ever had were simply meat and bread (and possibly a dash of spicy mustard). I think Katz's Deli is the best example of how good this philosophy can taste. So I guess that makes me a "less" kind of guy, but I'm down on "more" too, so long as the core of the sandwich is built on a solid foundation.